Hi friends….I’m in the midst of one last effort at flower production and pushing for completion by the end of November. Then I’m Done, Finished for 2011. December will be the time to enjoy the Christmas season of celebrations with family and friends. And just to ensure I follow through on this plan I have only a limited number of pin backs to use up. After that, they are gone and I will not be buying anymore until next year! 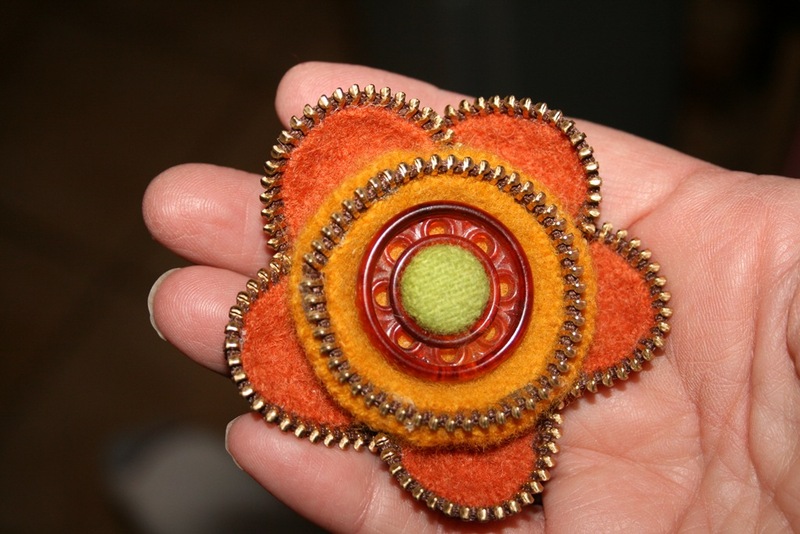 Poinsettias pins are so popular! A little sparkle and rich colors just look and feel just right this time of year. This years poinsettias are much smaller than last seasons, even so they are just as detailed. 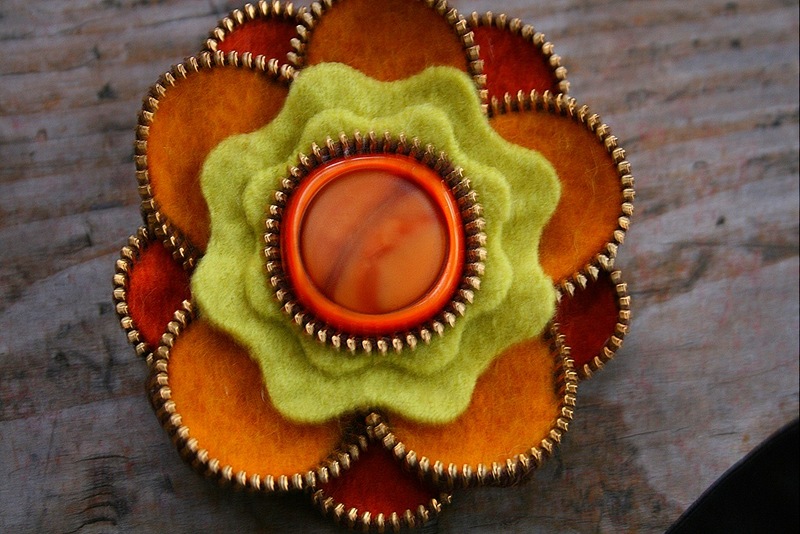 The above brooch is quite dramatic and large, its materials are felted wool sweater fabric, brass zipper pieces and a vintage button Its more difficult to make smaller size brooches, they seem to grow large quickly! The one below is much smaller and something I would personally be more comfortable wearing. (Although, I wish I would have added a couple of leaves). 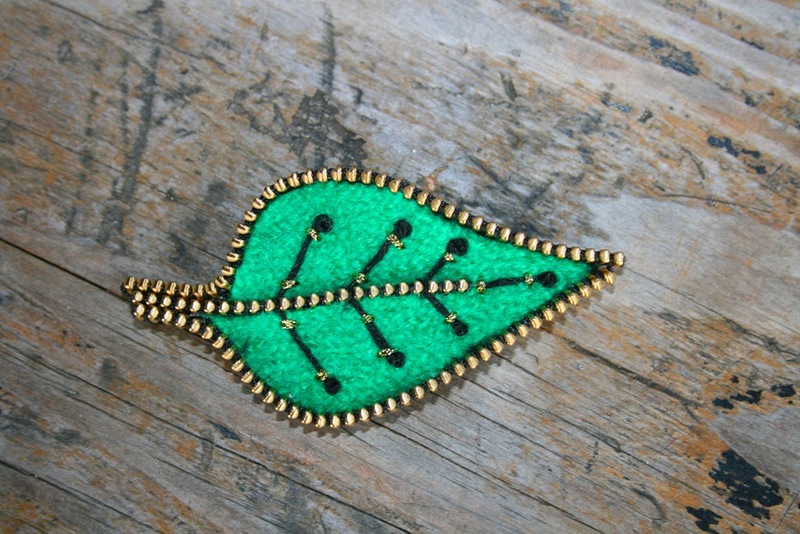 The leaf shape is currently my favorite to experiment with. I used black thread with gold accents to embroider this one. Loving the opportunity to embroider! 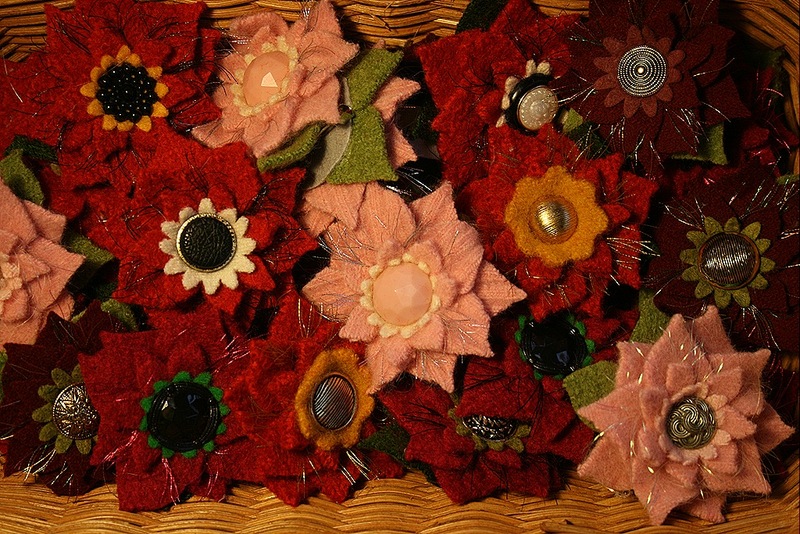 I totally owe the inspiration to use zippers in this way to amazing work of Odile Gova. (See my blob(g) post about it here.) Visit Odile’s etsy shop here. She generously shared her technique and urges her readers to try it and then make it their own. And that, is just what I am working on! Wow. You are really on a roll. Love the zipper pins. You have been a busy gal — but, then, you always are. The pins are loverly but the giant orange brooch is WOW!!! Love the zipper pins too! All gorjamous! Here is to your 2012 collection! Whoa! You are going a mile a minute.